KV63 - Coffin E - Human remains found? I've heard nothing new about the inscriptions on Coffin E since the television special, but that was only three days ago. They showed plenty of closeups of the coffin and its bands of inscriptions, and I myself was surprised by how thoroughly the resin coating obsured the inscriptions. And the coffin is in such sad shape that it might prove extremely difficult to remove much, if any, of the resin. Hmm. You think just a shot in the dark then, or perhaps something else? One thing that caught my notice about one of the coffins (B, I think) was that the woman pictured was of astonishing beauty, yet not quite the "Nefertiti" type of beauty, but a different, more "earthy" type. I've heard that Kiya is actually a nickname meaning "monkey" and I swear that's what the face kinda reminded me of. Anyway, to get back to something a bit more scientific, perhaps he got a hint off one of the other coffins. I don't understand that crossed arms on the coffin business. In 18th Dynasty burial practices, is that an indication of royalty? If nothing else Hawass was able to elaborate a little more on his pet theory about Kiya. He states that Kiya was already in place in KV63 and that Tut desired that when he died, he should be buried nearby her tomb. This implies that any old tomb would do, kingly or not. I still don't by it--the theory lacks evidence and logic. Or an explantion for why so many other people ended up in this "tomb" or, at least, their coffins. Could it simply be that we have yet to find such evidence? Who knows what still lies out there, under the sands? We can never write off future discoveries and the knowledge they'll bestow. It's interesting to note A3 trumpeting his wife's parentage, Akhenaten stressing his relationship to his father and mother, and then Tut, who, despite having occupied the throne for nine years, says nothing about his own parents. Not even, that I can tell, things which have been subseqently hacked out or changed. Curious behavior someone who kept his aten name for three years and who as far as we know, continued to rule from Amarna in the early going. Hmm. You think just a shot in the dark then, or perhaps something else? You mean the origin of Hawass's odd Kiya theory? I'm favoring a blind shot in the dark at this point--based not on evidence but on sentiment, which I don't find terribly reliable. In any case I don't think his theory has anything to do with the inscriptions on Coffin E, which at this point are still nearly unintelligible. 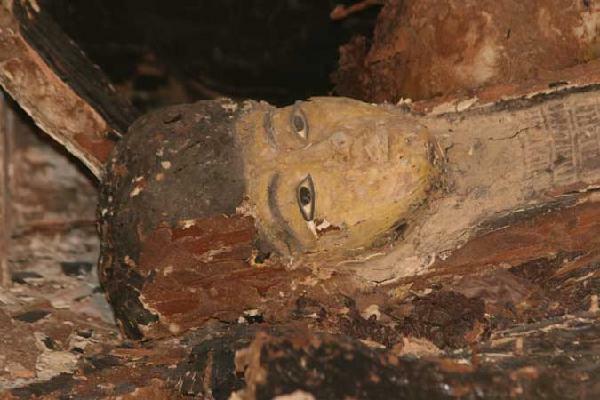 One thing that caught my notice about one of the coffins (B, I think) was that the woman pictured was of astonishing beauty, yet not quite the "Nefertiti" type of beauty, but a different, more "earthy" type. Here's a photo of the face of Coffin B. It's similar to my eye to the face of Coffin A, though not as artfully formed (but that could just be due to age and damage). The conservator Nadia Lukma is particularly fond of the face of Coffin F, for which I could not find an image to post. It's a particularly beautifully crafted face. This is the one Lukma calls "the princess coffin." And I think this is the only coffin so far about which the team is certain probably contained a mummy, based on its reed-mat lining with the impression of a body. A bit off topic, but I have to say I really like Nadia Lukma. I think she would be a pleasant person to know, and she's a consummate professional in her work. Anyway, to get back to something a bit more scientific, perhaps he got a hint off one of the other coffins. At least a couple of the coffins would seem to have been of such quality (originally, before the termites came along) that they had to have been crafted in the royal workshop. This is especially true of that large gilded shabti coffin. But I don't know how any of the other coffins may have contributed to Hawass's theory, so I can't elaborate on that. It's interesting to me that neither Otto Schaden nor anyone on his team has made such claims. They do concede that these coffins were made for high-status people and that some of them would date to the time of Tut (this based largerly on artifacts found inside the many jars). It is only Hawass and that other SCA official (can't recall his name) who are assigning specific identities to the original occupant of this tomb--either Ankhesenamun or Kiya. Not necessarily. The crossed arms of the mummy is more of an indication of royalty, but even then exceptions have been noted. I've personally seen other Dynasty 18 non-royal coffins, or have seen photos of such coffins, with crossed arms. It's interesting to note A3 trumpeting his wife's parentage, Akhenaten stressing his relationship to his father and mother, and then Tut, who, despite having occupied the throne for nine years, says nothing about his own parents. This would return us to our discussion about the burying of Tut's past, even while the boy-king was alive. Certainly Tiye's parents, Yuya and Tjuya, were very respected, highly placed nobles and people Aumnhotep III could brag about. Aldred and other scholars have argued that Yuya and Tjuya were also closely related to Amunhotep III. But even as Tut took the throne you can be sure the real powers behind that throne were actively working to hide all evidence of the Amarna Period, which would cause the young king not to leave evidence of any boasting about his parents.